British India enacted Land Acquisition Act, 1894 and other Forest laws to legalise their loot of the natural resources and address the political challenge posed by agrarian communities both tribal & farmer cultivators. These laws were aimed at arresting the ongoing protest and revolts of the Indian people and mainly the farmer. LAA 1894 became a tool to acquire land for installing mining, industries, railway line, Roads,irrigation & power houses. The 1894 Act consolidated the concept of Eminent Domain of the colonial state, which continued even after independence and the key question of who actually own the land remained unresolved. This resulted in many agrarian struggles in Independent India till the 70’s and large scale displacement and impoverishment due to massive acquisition of land in the name of public good, development and national interest. Globalization and neo-liberal reforms since 90s have only strengthened these struggles against loot of ntural resources and ensuing displacement. After years of struggles by the people's movements in the country, the colonial Land Acquisition Act, 1894 was repealed and a new law titled, Right to Fair Compensation, Transparency in Land Acquisition, Rehabilitation and Resettlement Act 2013 was enacted. Although, this new act did not resolve the key issue of eminent domain it did create some enabling provisions which would protect the rights of people against forcible acquisitions, minimise displacement, provide compensation and relief to livelihood loosers and not only to land owners. The inclusion of the provision of Social Impact Assessment was to address the interests of many other categories of the people beyond the land owning communities. There are many problems with the Act, and there is a scope for improvement of the Act to ensure protection of the land rights of the people and ensuring people's participation in the development planning process and making it FRA and PESA compliant. 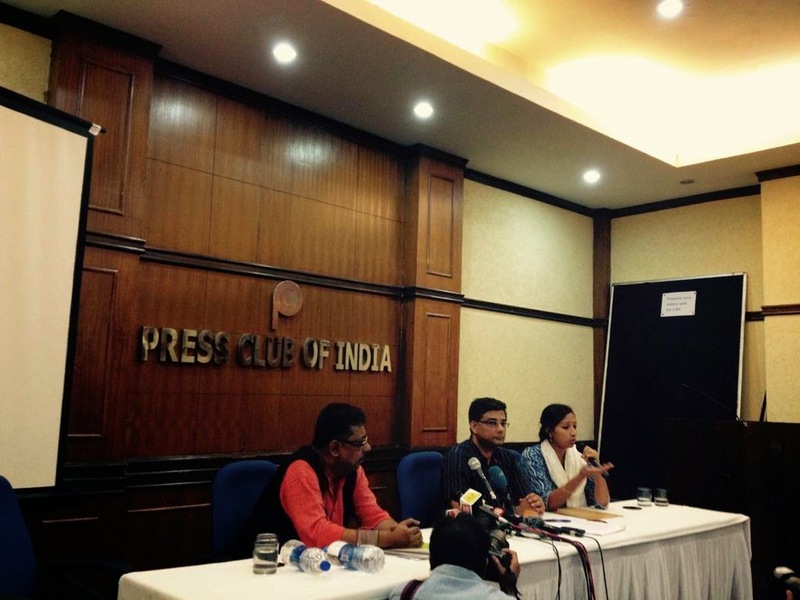 However, without ever making an attempt at implementing the law, without conducting any Social Impact Assessment, under a purposeful propaganda spread by the corporations and corporate media NDA government shamelessly promulgated the Land Ordinance along with Coal, Mining and other Ordinances by surpassing the Parliamentary process . This under the garb of legalities and putting the onus on Opposition for not letting the Parliament function. The Indian State has been engaged in covering the real conflict of ownership of land and has put it as a crisis in land acquisition for development. Just before the General Elections and Assembly Elections in many of the states NDA and UPA both claimed their efforts behind the enactment of 2013 Act. But once in power NDA took this anti farmer and workers move taking away even little window within the 2013 Act address the question of people's participation in development process, protecting farm land, seeking consent of the project affected and addressing the pain of the displacement and impoverishment due to loss of land and livelihood. The Ordinance in a stroke does away with the key provisions of the 2013 Act and takes away the right of a farmer to take away his / her land, it does away with the provisions to assuage the loss of livelihood and provisions which would have provided justice to millions whose land had been wrongly acquired in access or forcibly by the Colonial Land Acquisition Act, 1894. However, the Ordinance will not put an end to forcible land acquisitions and conflicts around that but increase the loot of precious natural resources and makes it even more draconian the 1894 Act. It will neither end the miseries of displacement and nor compensate the communities affected and hence our struggle for democratic development and against this corporate loot need to intensify. Land acquisition and along with that the conflict is going to increase given the large number of thermal power plants, dams, nuclear power plants, special investment regions, industrial corridors, manufacturing zones, highways, ports, airports, real estate projects and other infrastructure projects planned by the governments threatening the livelihood of millions and this Ordinance is to facilitate that. Along with the Land Ordinance, NDA government has brought in many other Ordinances and it seems that they are hell bent on bending all the democratic and parliamentary norms. NDA government in Centre and BJP government in many States are implementing the corporate agenda with much greater ferocity than any regimes till now. These ordinances will come up for passage during the Budget Session and a political response is needed to this from the people's movements. It is in this context that we invite you to a two day consultation to discuss and debate the provisions of these ordinances, its implications for the Parliamentary Democracy and response of the People's Movements in coming times. The meeting will be held on January 23-24th 2015 from 9:30 to 6:00 PM, at New Delhi. We do hope you will be able to join us for this important meeting and together develop a common strategy to fight the corporate design for land and resource grab and develop a counter narrative to the dominant development and growth propaganda. We look forward to be with you and do let us know, if you need more information.